After my disappointment at finding the Suisun Valley Road Bridge (23C0077) had been removed I was relieved to find the other historic Suisun Valley Road Bridge (to the south) still in place. However, it would be more accurate to say that they turned the existing structure (23C0076L) into the southbound bridge and built a northbound bridge (23C0076R) beside it. Like the other F.A. Steiger bridges, this Suisun Valley Road Bridge has very distinctive details such as the cleanly articulated borders around the closed spandrel arch walls and dome shaped end posts on the barrier rails. Apparently the team of F.A. Steiger as County Engineer and G.H. Gildersleeve as contractor resulted in some well designed bridges. 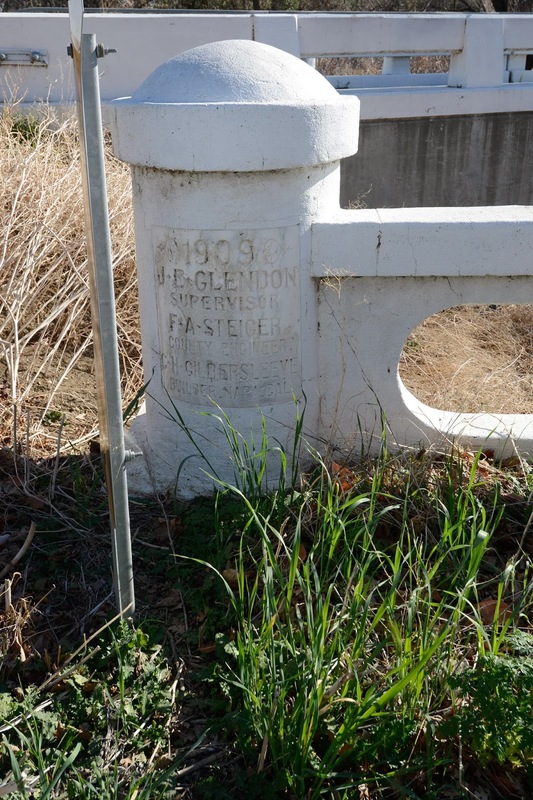 Their Suisun Valley Road Bridge across Suisun Creek was built in 1909, its in service 105 years later, and it's also eligible for the National Register of Historic Places. The arch span is 84 ft long but the bridge is barely 18 ft wide, which was why they built a parallel span beside it. That's a better idea than demolishing an old narrow (but still functioning) bridge. Solano County, California Bridges: Suisun Valley Road Bridge across Suisun Creek by Mark Yashinsky is licensed under a Creative Commons Attribution-NonCommercial-NoDerivatives 4.0 International License.